During the air battles that destroyed Nazi Germany’s ability to wage war, one bomb group was especially distinguished. At the outbreak of World War II, the United States was in no way prepared to wage war. Although the US declared war against Germany in December 1941, the country lacked the manpower, the equipment, and the experience it needed to fight. Even had an invasion force been ready, a successful assault on Nazi-occupied Europe could not happen until Germany’s industrial and military might were crippled. Because no invasion could happen without air superiority, the first target was the Luftwaffe—the most powerful and battle-hardened air force in the world. To this end, the United States Army Air Forces joined with Great Britain’s already-engaged Royal Air Force to launch a strategic air campaign that ultimately brought the Luftwaffe to its knees. 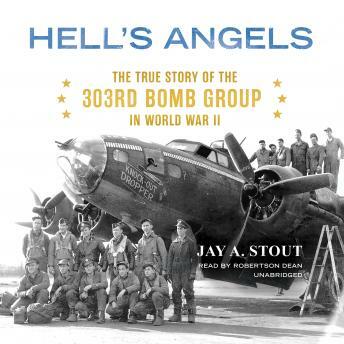 One of the standout units of this campaign was the legendary 303rd Bomb Group—a.k.a. Hell’s Angels. This is the 303rd’s story, as told by the men who made it what it was. Taking their name from their B-17 of the same name, they became one of the most distinguished and important air combat units in history. The dramatic and terrible air battles they fought against Germany changed the course of the war.